Explanation: What happens when galaxies collide? One of the best studied examples of the jumble of star clusters, gas, and dust clouds produced by such a cosmic train wreck is the interacting galaxy pair NGC 4038 / NGC 4039, the Antennae Galaxies, only sixty million light-years away. In visible light images, long, luminous tendrils of material seem to reach out from the galactic wreckage, lending the entwined pair an insect-like appearance. But this penetrating view from the new Wide-field InfraRed Camera (WIRC) attached to the Palomar Observatory's 200 inch Hale telescope shows, in false-color, details of some otherwise hidden features. 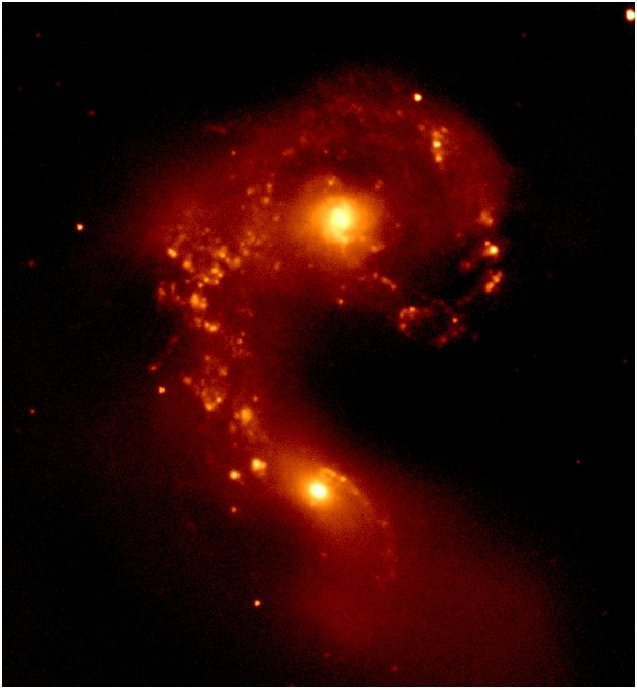 The large central nuclei of the two original galaxies dominate the near-infrared scene speckled with other bright sources which are themselves giant, newly formed star clusters. 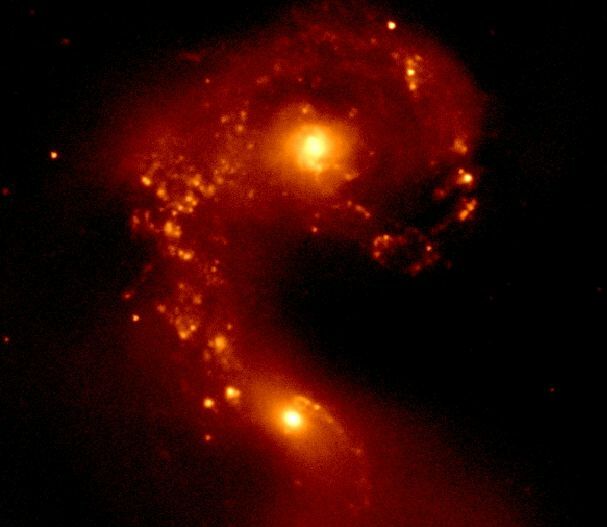 Remarkably the northern (topmost) nucleus, obscured in optical images, is also revealed here to have a barred, mini-spiral structure reminiscent of many "single" spiral galaxies.